"the cream of the art form"
Clouin is the master of the very short subject constructing his mini-narratives on the premise «less is more.» In his return NAP’s Video Festival, this French video maker gives us his version of Eros and Thanatos, love and desth. This tape begins with a quick walk through crowded cemetery shown through the eyes of a shaky hand held camera. closely edited glimpses of mausleum interiors - windows, doors, corners and slabs creates a maze made of bleak nooks and crannies. There is a quality of hunt in the way the images unfold, but, a hunt of what? In a twist on Marvel’s «The grave’s a fine and private place/But few I think do there embrace, «in a quick view of a partially clothed figure Clouin reveals that this graveyard is a popular trysting place. The 4th NAP Biennial Video Festival tour "the cream of the art form"
The 2001 "cream of the art form," selected by NAP jurors Mary Lucier, Ann Borin, and Ann-Sargent Wooster, included Pierre Yves Clouin's "Shadow Box" (2000, photo), as well as works by Van McElwee, Marie-France Giraudon & Emmanuel Avenel, Fred Levy, Dennis Summers, Thomas Fleisch, Takahik Iimura, Kiriko Shirobayashi, Gene Gort, and Paul Kaup. 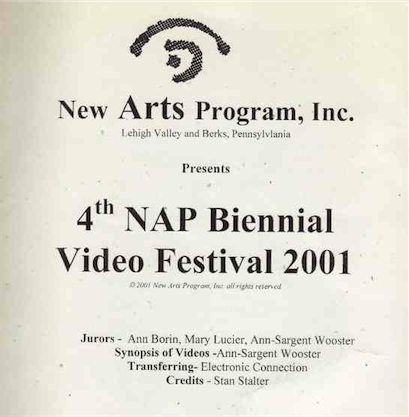 After opening at the NAP Exhibition Space in Kutztown, Pennsylvania, September 7 to October 27, 2001, the show toured the northeastern United States. “The 4th NAP Biennial Video Festival tour "the cream of the art form",” Pierre Yves Clouin, accessed April 23, 2019, http://pierreyvesclouin.fr/items/show/185.